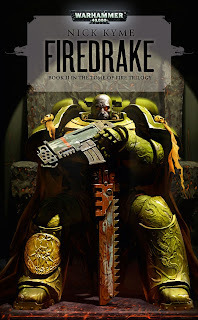 Lord of the Night reviews Firedrake by Nick Kyme. 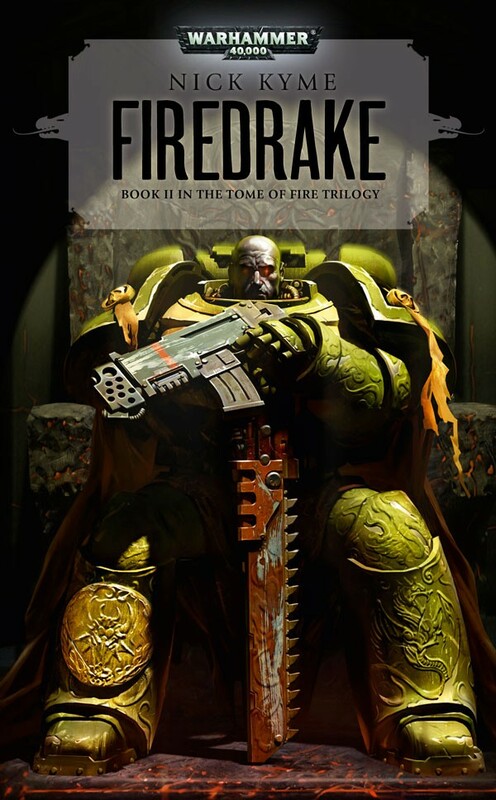 The Salamanders are back and doom is in the air as the second novel Firedrake kicks the series into overdrive. The end has begun, and prophecy will collide with the endurance of the Sons of Vulkan. The anvil beckons, and not all will survive being re-forged against its heat, or against the hammer’s blow. And for those of you wondering, that is Tsu’gan on the cover. Cool isn’t he?, though I pictured long flowing black hair. The Salamander’s uncovering of ancient prophecy on the hell-blasted world of Scoria has started the beginning of the end. The Forgefather has returned and will unlock the secrets hidden beneath Mount Deathfire that will guide the way, but in order to do the key must be found, and the key’s guardian Chaplain Elysius must be saved from his Dark Eldar captors. The Firedrakes are mobilized but will the sturdy 1st Company be able to save their brother from the hellish realm that is the Volgorrah Reef. The characterization is very well done. The returning characters are all taken further, through Elysius’s trials, Tsu’gan’s doubts and Dak’ir’s training, each is given much more depth and we learn more about each of them, be it what drives him, what is slowing devouring him, or what he is becoming. Many others appear and are taken further such as the dependable Ba’ken who serves as faithfully as ever in his new role, the devious Iagon who’s ambitions know no bounds and will likely be his undoing, and the wise Pyriel who becomes a mentor to Dak’ir and the bond between them becomes strong. New characters make their appearances such as Forgefather Vulkan He’stan who serves as an inspiration to Tsu’gan and leads the Firedrakes to rescue Elysius, and is shown that beneath the myth there lies a Salamander who wishes for nothing more then the bonds of brotherhood. Or the ferocious Zartath who is a dubious ally to the Salamanders at first, but soon proves himself despite his growing madness, and his very body, being sources of discomfort for the Sons of Vulkan. Kyme has created great new additions to the series and I hope to see both of them in the next novel. The action in the story is breathtaking. The development of the characters allows for very different types of fighting, from Tsu’gan and the Firedrake’s brutal styles of combat and vicious Salamander warfare, or Dak’ir’s newly found psyker powers which manifest into devastating flaming drakes and oceans of flame. Kyme does them all well and creates some very memorable moments, my particular favourite is the Forgefather as he tears through the Dark Eldar with the might of Vulkan and the legendary artefacts of the Nine, and of course new character Zartath was very cool to picture in combat. The pacing was well done and I never felt rushed during the story, Kyme knew when to speed things up and when to slow them down for flair. My attention was always kept either in combat, plot building or character growth, and every so-often a revelation of the story. The book ends on a bitter but very anticipating note, the end is approaching fast and the only one who can stop it, may just be the one who will cause it. Looking very forward to Nocturne, the final book in the Tome of Fire trilogy but thankfully likely not the last Salamander novel. I give Firedrake a 9/10, an excellent addition to the series, it could have been a perfect 10 but it lacked an utterly epic moment, the kind of part that pushes the score to a ten, it doesn’t just earn the 10/10, it takes it by force. But from what this novel has set-up, I have confidence that Nocturne will have many of those moments. Should you buy this book?. If your a Salamanders fan then you don’t need me telling you the answer to this. If you haven’t read them yet then ill give you the answer, yes. The Salamanders series is likely the best loyalist Astartes series out there, and is a must-read for fans of the Space Marines.